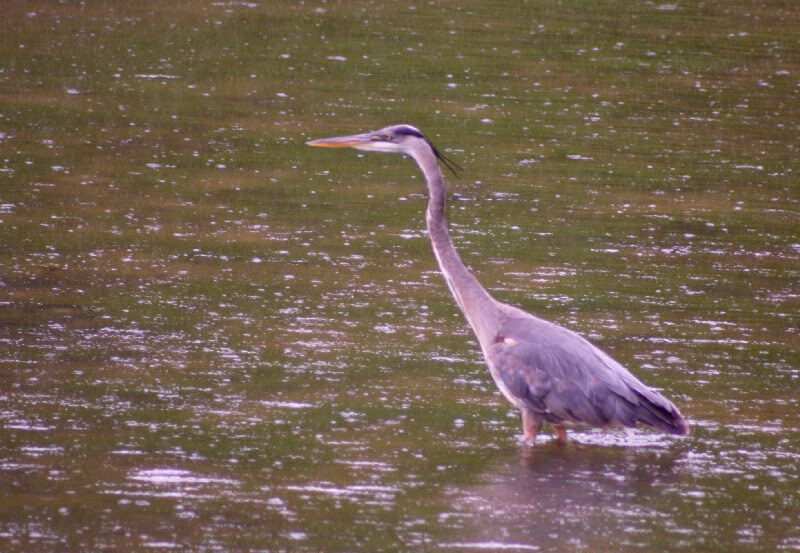 Heron standing in the shallow lake during a rainstorm - taken approximately a week ago. When the two come together, I pay attention. During an outdoor yoga practice yesterday morning, a blue heron flew in a straight line over my head. It certainly brought a smile to my face and the thought that perhaps I should look up the significance of an encounter with such a beautiful bird. Later that day, a blue heron flew across the path of our car and was close enough that my husband took notice and commented. Sure enough, a few hours later in another part of town, a blue heron once again took off and flew across the path of our car. This time even my skeptical husband was a bit taken aback. According to North American Native tradition, the Blue Heron brings messages of self-determination and self-reliance. They represent an ability to progress and evolve. The long thin legs of the heron reflect that an individual doesn't need great massive pillars to remain stable, but must be able to stand on one's own. Blue Herons have the innate wisdom of being able to manoeuvre through life and co-create their own circumstances. Blue Herons reflect a need for those with this totem to follow their on unique wisdom and path of self-determination. These individuals know what is best for themselves and need to follow their hearts rather than the promptings of others. Those with the Medicine of the Great Blue Heron may sit until the rest of us loose patience. And, when they follow the promptings of the heart, they are one of the most magnificent when they choose to soar. This is the message that Blue Heron brings. While my spirit was delighted, I did experience a quick skip in my breath. The reason? During that morning yoga practice where I'd seen the first heron, I had been attempting a mantra practice. With my in breath, I was repeating, "May I fully come into my truth" and with the out breath I was repeating, "May I fully express my truth and may others know and practice the same." It was self-awareness, self-determination I was aligning myself with on the mat and nature reflecting my message back to me. The past few months have been a continuous process of self-reflection and awareness, yoga and creative exploration. I have shared much of it with you. I am confident that the next few months are going to take the power of this process and begin a journey of fierce radiance. If the heron and the hawk have anything to remind me of, it is that I must be confident in my own truths and soar above the fears and doubts that may keep me from putting them into the world. It has come time for me to take these ideas that roll through my heart and head and to sculpt them into form like a sculpture emerging from the clay. It is selfish of me to do anything other than share. Our deepest fear is not that we are inadequate. Our deepest fear is that we are powerful beyond measure. It is our light, not our darkness that most frightens us.' We ask ourselves, Who am I to be brilliant, gorgeous, talented, fabulous? Actually, who are you not to be? Just for giggles (and maybe for a bit more if you believe in the power....), what is your mantra of the moment?